Chances are that if you are shopping online for a mens silk shirt and tie combination, there is a likely chance that it's a mens satin dress shirt and tie combination set that you're seeking. Contempo Suits specializes in satin shirt and tie combination sets in all kinds of colors for entertainers, music groups and people who are just looking for a good tuxedo shirt alternative. 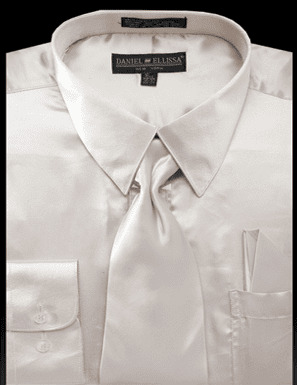 This beige color silk style satin shirt and tie combination features barrel cuffs that can be worn either buttoned or with cuff links, a pointed style collar and the matching tie and hanky set. Fabric is Poly Satin.